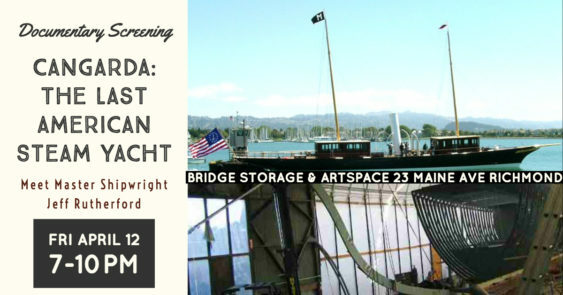 Join Master Shipwright Jeff Rutherford at Bridge Storage and ArtSpace on Friday, April 12th at 7pm for a documentary screening followed by a discussion. Classic steam yacht Cangarda was built in 1901 at the Pusey and Jones Shipyard in Wilmington, Delaware. She is 136 feet long, and weighs 125 tons, the size of a small airliner. Cangarda is one of three remaining Victorian era steam yachts in the world. In 2004, Richmond’s own Jeff Rutherford, Owner of Rutherford’s Boat Shop, teamed up with owner Bob McNeil for a full restoration of this classic yacht, which was documented in the film “Cangarda: The Last American Steam Yacht”, as part of the Ultimate Restorations documentary series. The documentary allows you to watch as the boat is completely rebuilt, and the original machinery restored. Every piece of her interior, deck joinery, funnels, scroll work, skylights, interior joinery, plumbing fixtures, hardware and all seven of her original steam engines has been removed, rebuilt, and reinstalled. We invite you to join us at 7:00 pm for refreshments in Bridge’s main Gallery. At 7:30 pm we will move into Bridge FilmSpace for a screening of the documentary followed by a Q&A with Jeff Rutherford.